The informal sector and its workers form a significant portion of the world’s economy. According to 2018 Women and Men in the Informal Economy: A Statistical Picture from the International Labor Office (ILO), 61% of all workers globally are informally employed. That means almost two billion workers remain invisible from any government’s eye and hence are often kept from accessing crucial social and financial resources. Across all regions and governing systems, the informal economy is diverse and includes a range of small-scale and large enterprises. In developing countries like India, 70% of informal work is self-employed. Though this work allows individuals to escape extreme poverty by earning income, informal workers typically earn less, have unstable income sources, and lack access to basic protections and services. The sector and its workers are often stigmatized as difficult to manage and historically informal workers have been seen as an opposition to the formal economy. There is an interesting intersection of recognizing and supporting informal workers that is naturally in line with moving towards circular economies, which minimize waste and prioritize repair, reuse, remanufacturing, refurbishing, recycling, and upcycling. Circular economies are regenerative and require redesigning economic activities with a more holistic view of a country’s systems at all levels — small and large businesses, organizations and individuals, globally and locally. The poor already operate in a circular economy; their small business viability and familial existence depends on extreme efficiency and optimization of energy and materials. Recognizing and incorporating informal workers into circular economies is critically important to bring the required systemic shifts that build long-term resilience, generate business and economic opportunities, and provide environmental and societal benefits. 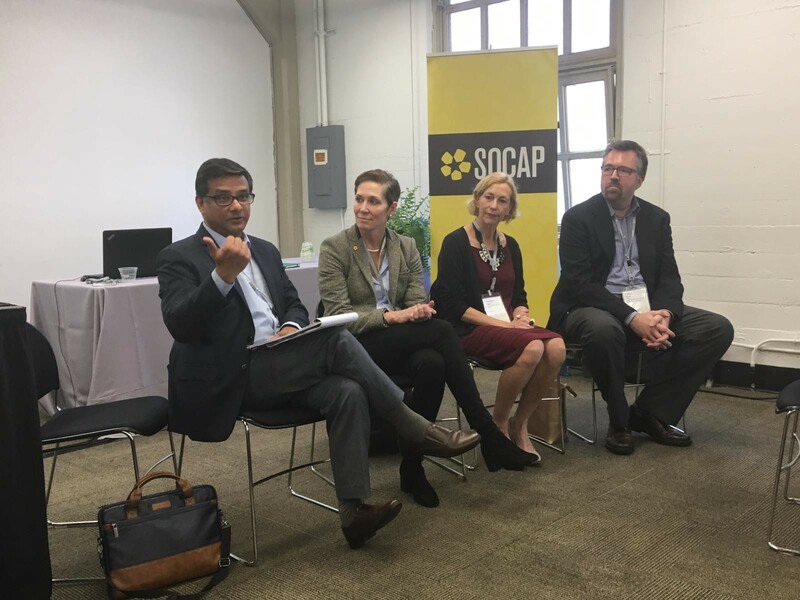 I had the privilege of leading a panel discussion at SOCAP18 called ‘Informal Workers: The Front Lines of Enabling Circular Economies.’ The experts on the panel included Libby McDonald, Lecturer at MIT–D Lab, Eleanor Allen — Global CEO of Water for People and Chris Flood — Development and Resource Mobilisation Manager at GAIA –US. The panelists at this session all work within the waste sector, but it should be noted that the issues that informal workers face span many sectors and facets of our economies. By taking a close look at all of the available evidence we can distill some of the ecosystem principles that need to be in place in order for circular inclusive economies to work effectively. Here are seven necessary ecosystem principles that panelists identified during our discussion on this topic at SOCAP18. 1. Inclusiveness in the informal sector. Country level, state level and local level governments need to acknowledge and appreciate that all informality need not be culled in the guise of ‘smart development.’ Accept inclusive economy stakeholders and support them. Don’t demonize or exploit them. These stakeholders need governance or policy support, not financial doles. 2. Solutions that address the unique role women play in society and in the economy. Women occupy a major portion of the informal sector, working as home-based workers, agricultural labor, construction labor, street vendors, waste pickers,etc. at comparatively much lower wages and sometimes as unpaid labour. A good 58% of workers in the waste sector worldwide are women and as much as 92% of women work in the informal sector as per the ILO 2018 report. These women support their families financially while also raising children, looking after other family members, and tending their meager dwellings. Any solution that is designed through the lens of circularity and inclusivity must be designed with consciousness of gender at the core of its configuration. Non-comprehensive solutions that do not take gender into account are designed to fail. 3. Activism and citizen advocacy. Citizen participation and activism add a distinctive zing to this sector. Globally, many governments act only when citizens rise, ask questions and push the status quo. Bangalore in southern India is a good example how citizens have come together and challenged urban local bodies (ULB’s) — both in courtrooms and on the streets, to push for change — largely in the waste and water commons space. Urban Local Bodies (ULB’s) often struggle to handle these issues. It is wrong to assume that most local administrators are corrupt or have vested interests. They work under tremendous pressure, have vested lobbies influencing them, are low paid, are low on motivation, and sometimes are incompetent. Ecosystem players, like capacity building bodies, nonprofits, and training institutions, have to have strategy and stamina to make these bodies work. Easier said than done, but there are successful examples to look to. In 1995 Surat, a big port city in Gujarat in western India, was ravaged by deadly floods and infested with plague. Municipal Commissioner U R Rao came in, cleaned up the city and turned what was one of the dirtiest cities in India into one of the cleanest. 5. Policy interventions and exemplars based on experiences. Geographic ‘ideas inter-portability’ can be an important tool to transfer domain knowledge and learnings to like-to-like parts of the world. What can Bangalore learn from Medellin or Barranquilla in Colombia? Or better still, are there any learnings from Kochi, Kerala or Panaji, Goa (all cities in India) that can be absorbed and modified in other parts of India? What can be learned from Malang in Indonesia that can be adjusted for Kampala in Uganda? 6. Up-skilling and capacity building. Up-skilling and capacity building is not be contained only within the ULB’s. These needs are also needed within the circular economy stakeholders themselves. How can basic enterprise support be given to help develop small viable businesses? However, each capacity builder needs to note that a preconceived notion of condescending support has to be eliminated when they work with circular economy stakeholders, else it’s a road to nowhere. Typical business needs for these communities are access to reasonable cost finance, access to basic infrastructure and access to basic business systems support. One must remember that more often than not, they need hand holding support, not cash bail outs. The problems are huge and solutions need to be matching. Without getting into the conundrum of scale or replication and getting mired into the binaries that often tangle, it is imperative all stakeholders, governments, non-profits, civil society players, ULB’s, capacity players, banks, financial institutions, investors, and others, to do a collective heave to make this informality work! Global unemployment remains elevated at more than 190 million. In 2017, around 42 percent of workers (or 1.4 billion) worldwide are estimated to be in vulnerable forms of employment, while this share is expected to remain particularly high in developing and emerging countries, at above 76 percent and 46 percent, respectively. Overall, progress in reducing working poverty is too slow to keep pace with the growing labor force in developing countries, where the number of people in extreme working poverty is expected to exceed 114 million in 2018, or 40 per cent of all employed people. Unemployment in developing countries is expected to increase by half a million per year in both 2018 and 2019, with the unemployment rate remaining at around 5.3 percent. 82 percent of women in developing countries are in vulnerable forms of employment in 2017, compared to 72 percent of men. Globally, the average age of the labor force is expected to rise from nearly 40 in 2017 to 41 in 2030, growing considerably faster in Europe and Eastern Asia, notably China. The reality is staring at us. The conversations started at SOCAP18 indicate that many players are taking the critical first steps towards addressing these issues. But it is time that institutions and governments accept this reality and become part of the solution.